Seasonality typically affects inventory levels, buyer demand and median home prices, often in significant ways – as is illustrated in the following charts. However, it is not the only factor affecting market conditions and trends – general economic conditions, new construction projects coming on market, sudden changes in interest rates, stock market IPOs, natural and political events, and other factors can and do impact the market as well. It should also be noted that new listings and new sales occur every month of the year – and sometimes, depending on prevailing market conditions and the specific property, buying or selling during the slower periods can be the smart strategy. The devil’s always in the details, and the details of the market change constantly. Still, there is a typical ebb and flow to the level of activity in the market that correlate with seasonality, and that is what this report explores from a variety of angles. Without inventory, there is no market. These first 3 charts show the classic effects of seasonality on supply and demand. As seen in this next chart, the higher-price end of the market is usually more affected by seasonality that the general market. Among other effects, this will usually raise the median sales price during the peak spring and autumn selling periods, and lower them in the slower periods of summer and mid-winter (as delineated in the final chart). Note: In the chart, the changes up and down in sales are plotted based upon the sales of January 2013 equaling a base line of 100. This is a very approximate illustration, because of other factors that affect the analysis, though we do believe it reflects the market reality. This final chart illustrates both the rapidly appreciating real estate market since 2012 and the shorter term ups and downs that seasonality can play in median home prices. Of course, in an appreciating or depreciating market, there are usually other factors impacting median sales prices as well – as always, what is most meaningful is the longer term trend in home prices, not short-term fluctuations. 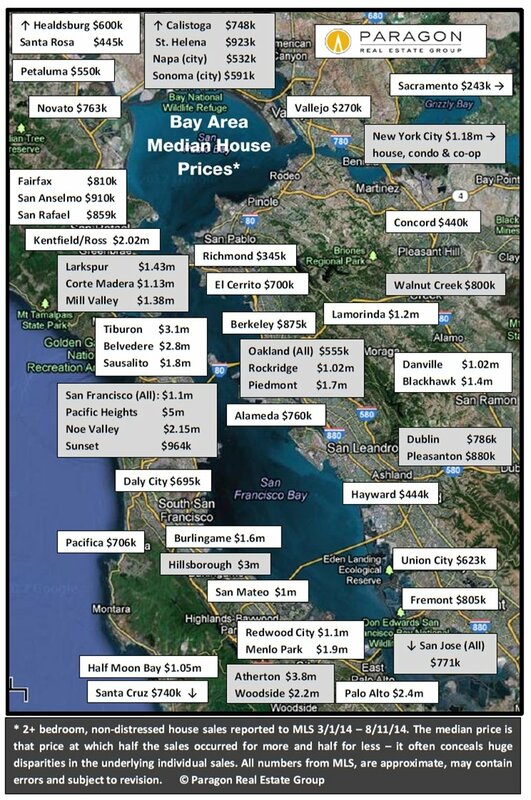 Our updated map of comparative house values around the Bay Area: The trend virtually everywhere around the Bay has been continued appreciation since the recovery began in earnest in early 2012. Please note that median sales prices and average dollar per square foot values are statistical generalities that may fluctuate for a number of reasons. 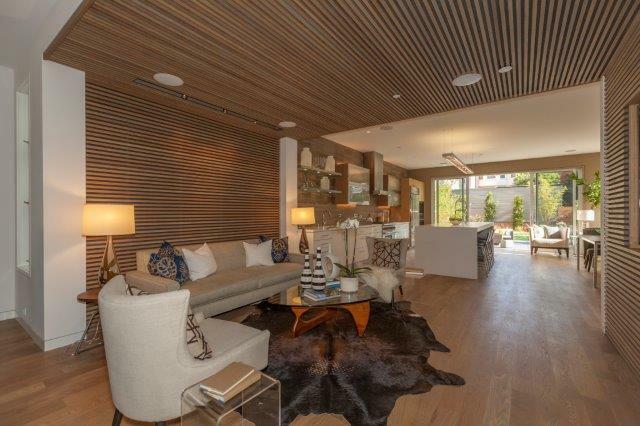 Luxury home sales have soared all around the Bay Area, but are concentrated most in the 3 counties most affected by the high-tech wealth boom – Santa Clara, San Mateo and San Francisco – as well as Marin, which has been a very wealthy county for a long time. 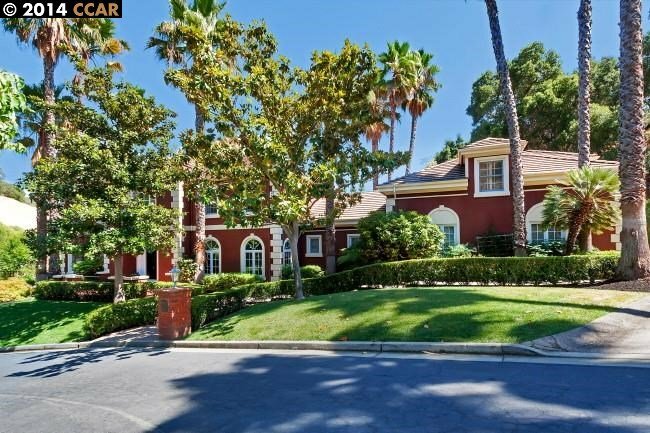 In San Francisco, condos and co-ops make up a significant percentage of high-end sales (and generally achieve the highest dollar per square foot values), but in other counties, the luxury segment is comprised almost exclusively of houses, estates and, in the wine country, ranch/vineyard estates. As a point of context, Santa Clara is the most populous Bay Area county with about 1,875,000 residents; then come Alameda (1.58m), Contra Costa (1.1m), San Francisco (835,000 residents, about 60% of whom are renters), San Mateo (750k), Sonoma (500k), Marin (260k) and Napa (140k). As a percentage of total sales, homes selling for $2,000,000 and above make up about 13% of Marin’s market, 11% of San Francisco’s, 10% of San Mateo’s, 7% of Santa Clara’s, 5% of Napa’s, and under 2% in Sonoma, Contra Costa and Alameda Counties. Solano had no home sales over $2m reported to MLS during this period. Of course, $2,000,000 will buy you a lot more in some counties and neighborhoods than in others. The devil’s always in the details – and this is only a broad brush overview. Below are 2 of 8 updated tables breaking down the city’s 2014 YTD sales by neighborhood, property type, bedroom count, median and average sales prices, and average dollar per square foot value. Each table is in order of median sales price. All 8 tables can be found online here: San Francisco Home Values.